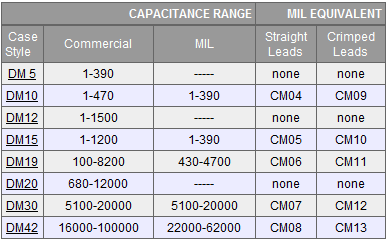 SE Capacitor Dipped Mica Capacitors are designed to meet the exacting physical, electrical and environmental requirements of the MIL-C-5 and RS-153 specifications. Why use Mica in your appplication? It is well known that natural mica is extremely stable against heat. SE Capacitors are manufactured from selected Indian ruby muscovite mica having optimum electrical characteristics. Silvered mica is made by printing electrodes on mica film with special silver paste. The silvered films are stacked to the desired value interleaved with metal foils for contact. Then the terminals are clamped on to the element. (The terminals are copper clad steel wires finished with a solider coating for good solderability). The clamped unit is either dipped under vacuum in epoxy resin and coated with epoxy powder conformally or dipped in phenolic resin and vacuum impregnated with liquid epoxy resin. The envelope thus formed gives high moisture and heat resistance to the unit. 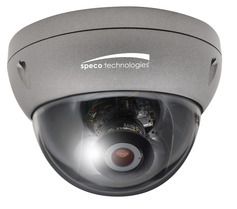 This design ensures high reliability and stability. Alpha's EcoCable® Line family is growing with their newest addition of the EcoCable Mini! The EcoCable Mini is the smallest and lightest 300 V cable ever! It is ideal for power and signal transmission applications in medical devices and semiconductor manufacturing equipment. Neutrik has made a design improvement to part number: NADB*MF*, which affects products NADB9MF, NADB9MF-B, NADB15MF and NADB15MF-B. They have changed the dimension of the D flange to improve ground contact by adding copper film. Neutrik will continue to ship current product until depletion of stock, but the new products will be identified with a G44 date code. As mentioned earlier this year, Magnecraft is discontinuing the 782 Control, 750 and 788 Series Relays. These products are now being replaced by the Magnecraft 792, 750R and 788R Series of products, which provide enhancements. After 62 years manufacturing off-the-shelf and special High Voltage Capacitors in the northwest side of Chicago. Plastic Capacitor has closed operartions and is not longer taking order for customers. "I am writing this letter to advise you of current business conditions and the effect it is having on our lead times. The business environment is good, and we see strength in many of our end markets including industrial, automotive, housing, consumer electronics and personal computing. We are also seeing exceptional strength in some of our new products and technologies, which are growing at double digit percentages sequentially. As a result, many of our product delivery lead times have stretched out and we are selectively capacity constrained in our wafer fab, wafer sort, assembly, and test operations, particularly on these new products and technologies. Many of our product lead times are currently between 6 weeks and 18 weeks. We are ramping all of our factories as quickly as we can, yet are limited by our suppliers’ lead times. We have increased our capital expenditures for current fiscal year from $125 million to $175 million, the highest in over a decade.Thank you for your business. " 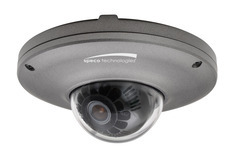 Intensifier IP cameras are now integrated with Exacq, a leading developer of open architecture, Video Management System (VMS) solutions for security and surveillance applications. We received a letter from Techspray providing an updated status on their recent move to the new facility in Kennesaw, Georgia. First off, they would like to extend their apologies for the “frustration and anguish due to a lack of communication” with the move. The transfer to a new facility, combined with a SAP software conversion, led to a “tidal wave” of problems. Losing key employees, hiring, and training added to the disaster. A problem we are all experiencing is the lack of response to shipment status questions. Finally, order acknowledgements with expected ship dates are being received and emergencies (line down, stock out for critical processes) are being taken care of quickly. Additionally, weekly updates on back orders are being sent. New orders are being shipped in one to three weeks depending on the manufacturing schedule. As we receive updates, we will pass along. The shelf life of our Metallized Film AC and DC Capacitors is essentially infinite, if capacitors are stored unenergized in a non-corrosive environment and without damage at any temperature between -40C to +90C. Operating temperature is -40C to +70C. Electrical characteristics are expected to remain stable for at least ten (10) years or longer.